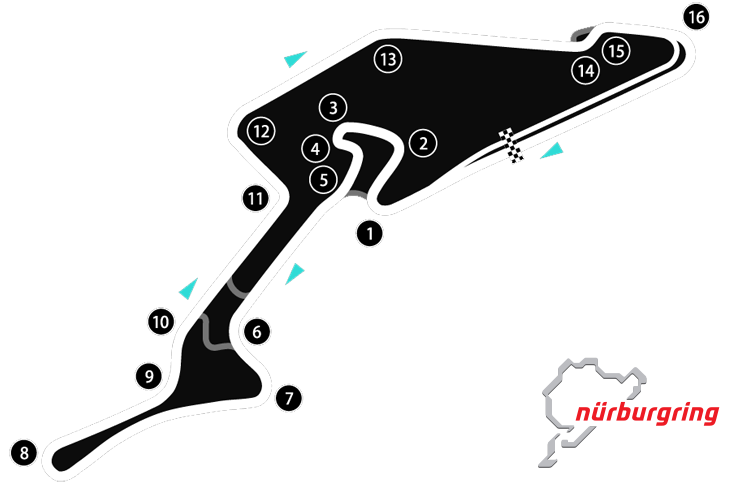 Nürburgring is a 150,000-capacity motorsports complex around the village of Nürburg, Rhineland-Palatinate, Germany. It features a Grand Prix race track built in 1984, and a much longer old “North loop” track which was built in the 1920s around the village and medieval castle of Nürburg in the Eifel mountains. The north loop is 20.8 km (12.9 mi) long and has more than 300 metres (1,000 feet) of elevation change from its lowest to highest points. Above all other circuits, the Nürburgring has a history and tradition which is intertwined with that of the motorsport itself. The ‘Green Hell’, as Jackie Stewart so memorably described it, has been thrilling and terrifying drivers in equal measure since 1927 and any event here remains one of the greatest spectacles and challenges on the sporting calendar. Like many of the lavish venues established in the modern era by oil-rich states seeking to boost their country’s international status, the Nürburgring owes its existence to political manoeuvrings. The Nordschleife (literally, northern loop) features sweeping curves, variable surfaces, rapidly changing weather, dramatic climbs and drops, and a straightaway over a mile long where terminal speeds can be reached. It is the yardstick by which all production cars are measured. It is as unique as it is overwhelming. There may be other tracks, but there is only one Nürburgring. The legendary circuit will be the host of GT4’s fifth race as a part of ADAC GT Masters.